After a brief and massively addictive dalliance two years ago, I decided that foursquare was pointless, commenting on a private blog that I’m “too square for foursquare”. Since then, foursquare has changed – hugely – as I found in out during a presentation at Mobile World Congress by foursquare’s Holger Luedorf, who stood in at short notice for CEO Dennis Crowley. Two years ago, it was little more than a largely static log of who’d checked in where – whereas today, foursquare has started branching out, by offering location-based services (LBS), once seen as the Holy Grail of the mobile industry. LBS essentially means being able to offer locally-relevant products and services to passing consumers – not just those who are in the right place, but at the right time (what’s the point of a 3am ad for all-day breakfast when you close at midnight?). There are a number of apps now available – and different approaches, with Qype and TripAdvisor offering mobile access to reviews, while foursquare is taking the “recommended by friends” approach. One month in and I’m seriously wondering if I’m too square for foursquare. This is despite making fantastic progress. I’m the Mayor of 20 places (of that, more later), folks including “Lutz S” (a total stranger but looks like a nice boy) wanna be my friend, and I’m collecting badges like it’s 1983. But … I’m bored. Short of checking into (more) places I pass during my daily routine, and adding places that are off the beaten tech track, there’s precious little to keep me loyal. I’ve finished in the top 10 charts for my region for several weeks on the trot – but have no desire to top ’em. Now THAT is nerd-dom at its finest. Back in 2010, I’d started gaming foursquare: checking into nearby locations while waiting at traffic lights (some of the signal phasing in Munich leaves plenty of time for idle hands) … apart from gaining points, there was little purpose. Today, there’s more of a community spirit – I’m “playing” in a league of check-ins friends from Facebook and Twitter, and getting tips on things to do – mostly centered on food and drink (which is fine!). There’s less of a focus on checking into multiple places for the hell of it … although one or two of the daft check-in points I created two years ago are still going strong. There are also a lot more locations on Foursquare – and private residences are largely filtered out of search results, unless you’re friends with that person, or you look for a venue specifically. As the foursquare Mayor of OnPR HQ, I’ve tried offering specials, but have been bounced back because we’re an office, not a coffee shop – nevertheless, anyone on foursquare who feels the need to drop in for a chat is welcome to a free coffee (if the Mayor is in the house). So far I’ve seen little use of foursquare for PR purposes – at least here in Europe. Perhaps it’s different in the US. The most creative so far was the Nokia Gift Machine which was in action at Mobile World Congress. It was activated by Tweeting the hashtag, and advertised mainly by foursquare updates. So of course I tracked it down, and almost immediately after tweeting, the machine dispensed a promising looking blue-tube – which in my case contained a candy bar. Naturally, I was hoping for a “candy bar” mobile phone – for a lucky few, this tweet came true. However, there is plenty you could do with foursquare, when it comes to PR. For a start, it’s a digital back channel: potentially damning for any business that isn’t aware of what’s being said about its products or services. Thinking further ahead than the “freebie for the Mayor” (which isn’t particularly interesting for everyone else, especially as foursquare’s popularity grows), there is a massive crowdsourcing opportunity for venues to incentivize users for check-ins, recommendations and tips. You could even use foursquare for practical purposes (gasp!) for example by helping to identify the availability of on-street parking spaces in busy city centers. It’s not just gamification! 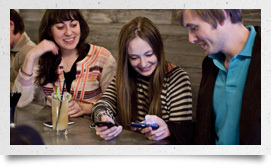 Foursquare also proves that today, businesses can’t afford to ignore social media. Luedorf said at MWC that foursquare has around 15 million people active users, which is just a tiny fraction of the two billion people now connected to the internet – but as this number grows, so a bad rap on foursquare could start to affect business. For companies which are still dismissive of social media – or who simply don’t see the need – then foursquare reviews could be an eye-opener. And dealing with a crisis isn’t the best way to learn how social media works – my recommendation is to take the plunge and find out how it works before it has a major impact on your business.